“This is a terrible thing. I’ve been in many demonstrations all across the South, but I can say that I have never seen—even in Mississippi and Alabama—mobs as hostile and as hate-filled as I’ve seen here in Chicago.” —Martin Luther King Jr.
On Nov. 5, 2016, Joshua Beal was in Chicago for his cousin’s funeral and, while driving back from the burial, was gunned down by an off-duty Chicago police officer. Black Lives Matter Chicago was attending a birthday celebration in honor of the late Rekia Boyd, who was killed by Chicago Police Officer Dante Servin in 2012, when we learned of this news. We then immediately went to provide support for the family, and what resulted that night, as well as in the days to follow, was eerily reminiscent of Jim Crow America, except that it was the North and 2016. Shouts of “Niggers go home” by white residents of Chicago’s far-south neighborhood of Mount Greenwood permeated the atmosphere. Bats and knives were confiscated by police from white residents who shouted racial epithets at the family of Beal, who had been killed just hours prior. The following day, a white mob marched through the streets of Mount Greenwood and cheered in jubilation at the location where Beal was executed. 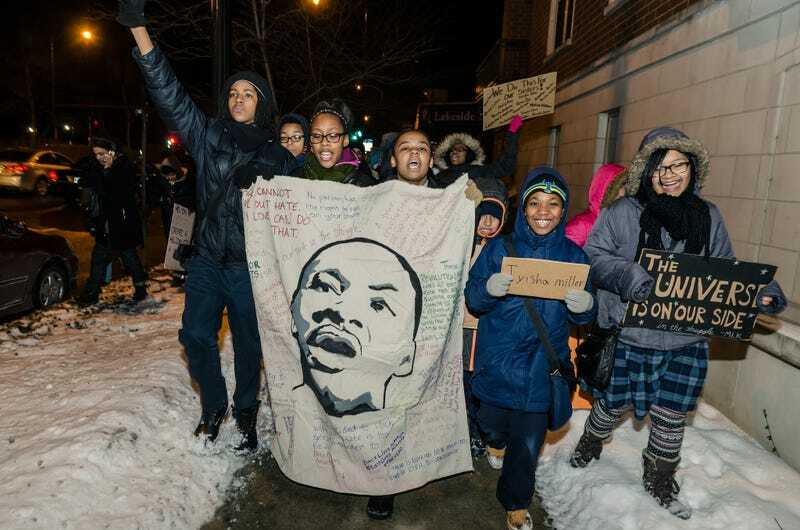 This is Chicago 50 years after Martin Luther King Jr.’s death. Over 770 people were killed by Chicago gun violence in 2016. Eleven people were gunned down by the Chicago Police Department, five deaths occurring within the month of November alone, including Joshua Beal’s. Nearly half of young black men in Chicago are out of work or out of school, and Illinois has the largest black unemployment rate in the nation. In 2013 Mayor Rahm Emanuel, President Barack Obama’s former chief of staff, conducted the largest mass public school closing in U.S. history by shutting down 50 public schools, primarily located on the South and West sides. In 2015, parents staged a hunger strike in order to prevent the closing and privatization of a South Side neighborhood’s only high school. Since then, Emanuel has closed an additional 21 schools and laid off over 1,000 teaching professionals. In 2012 the mayor closed half of Chicago’s mental-health-care clinics. In 2016 the remaining clinics struggled to remain open because of lack of state funding caused by Illinois Gov. Bruce Rauner’s budget stalemate. Chicago has been labeled America’s most segregated city. While white Chicagoans’ income has increased by 44 percent, black Chicagoans’ income has actually decreased by 4 percent. It is within this context that Chicago’s violence exists, and it is within this context that Mount Greenwood’s violent racism must be understood. The World Bank and many other entities have released studies that confirm that there is a correlation between income inequality and violence. The wider the gap between the rich and the poor, the more violence a society experiences. Chicago’s violence should not be a surprise to anyone who has been paying attention. In 1966 King moved into the North Lawndale neighborhood on the West Side to work on fair-housing discrimination and poverty affecting black Chicagoans. Fifty years later, North Lawndale remains one of Chicago’s most impoverished and underresourced neighborhoods in the city and is over 90 percent black. It is a mecca for drug sales and home to the city’s heroin epidemic. The resulting gang wars are a consequence of this survival economy. The cause and effect of divestment and the emergence of violence are most aptly displayed in the neighborhood of North Lawndale and the West Side of Chicago. King died working on a Poor People’s Campaign and demanding that a redistribution of wealth was necessary to eradicate poverty. Black Lives Matter Chicago echoes this demand and asserts that violence in Chicago will not end but will only worsen if continued divestment, unemployment and blight occur. The solutions to addressing poverty are well-known. We must implement the radical measures King died fighting for right now by demanding fully funded schools, health care, jobs, access to housing, free drug-treatment programs and food. The fact that these demands are considered radical today are a testament to how little regard our political establishment prioritizes life and how little has changed since King’s day, even since the nation has experienced its first black president. For some time now, King’s legacy on mainstream media has been bastardized, completely removed from his actual work. This gross misrepresentation of King is all about the sanitized “dream” devoid of reality. It would have us sleep through police shootings, a monstrous legal system that unjustly and disproportionately eats up black communities, and a lack of quality educational and employment opportunities to dream of a better day of equality and brotherhood. We see images of a smiling or thoughtful King, likely thinking of peace and looking crisp and clean in his suits, quite unlike today’s protesters. We think of King and we hear freedom ringing on mountaintops and in valleys and ignore the cries of oppression even in the streets named after him. We have conflated nonviolence with passivity, and we have forgotten that King’s legacy is meeting incredible violence with masses in the street. After being stabbed in Harlem, King organized and marched. When rocks were hurled at him in Chicago, he marched. Facing billy clubs, dogs and hoses in Birmingham, Ala., he marched. From jail, he fought with his pen, and when his own government conspired to destroy his family, he fought back. King worked with the people and tools available to him. We must remember King when we see protests in the streets; when we watch those in Syria fighting bombs with tweets, when we hashtag and #SayTheirName, we remember and reclaim King’s legacy. In Chicago, that means Black Lives Matter is centering the hood. On King Day, we are meeting and discussing with the North Lawndale community King’s radical legacy in Chicago fighting for economic justice. King, along with many others, organized the Chicago Freedom Movement, which included a large rally, marches and demands to the city of Chicago. These specific demands covered a wide range of areas, including housing, quality education, transportation, job access, income and employment, health, wealth generation, crime and the criminal-justice system, community development, tenants rights and quality of life. And one day we must ask the question, “Why are there 40 million poor people in America?” And when you begin to ask that question, you are raising questions about the economic system, about a broader distribution of wealth. When you ask that question, you begin to question the capitalistic economy. And I’m simply saying that more and more, we’ve got to begin to ask questions about the whole society. Chicago’s poverty and violence are a result of political policy. Chicago’s violence will end when we are able to create a more just and equitable society. To do that, we must pick up the mantle that King provided us and demand fair housing, jobs, fully funded schools and equal redistribution of wealth. We must confront the triple evils that King highlighted by resisting despair and instead beginning to organize with the conviction that history is on our side. I am convinced that if we are to get on the right side of the world revolution, we as a nation must undergo a radical revolution of values. We must rapidly begin ... we must rapidly begin the shift from a thing-oriented society to a person-oriented society. When machines and computers, profit motives and property rights, are considered more important than people, the giant triplets of racism, extreme materialism, and militarism are incapable of being conquered. Kofi Ademola Xola is a Pan-African who has dedicated his life to the struggle for black liberation. He has spent half his life working in social services and doing youth programming and development, gang intervention, conflict resolution and community organizing. He has worked in teen homeless shelters and advocated for LGBTQIA rights in those spaces. Since developing a better class and race analysis on how systems in America are intrinsically racist, authoritarian, heteropatriarchical and capitalist, he has reoriented his work toward abolishing harmful institutions like prisons and policing and reimagining new egalitarian systems that center the most marginalized. Amika Tendaji is a mother, a longtime Chicago organizer, a co-founder of Ujimaa Medics and a member of BLMChicago. She is also a poet, photographer, artful dodger, orca lover, milliner, sand artist, time traveler, base builder, tightrope walker and a flamethrower extraordinaire. Aislinn Pulley is a lead organizer with Black Lives Matter Chicago. She is an organizer with We Charge Genocide; a founding member of Insight Arts, a cultural nonprofit that uses art for social change; and a member of the performance ensemble, End of the Ladder. She is a founder of the young women’s performance ensemble dedicated to ending sexual assault, Visibility Now, as well as the founder and creator of the urban youth magazine Underground Philosophy.